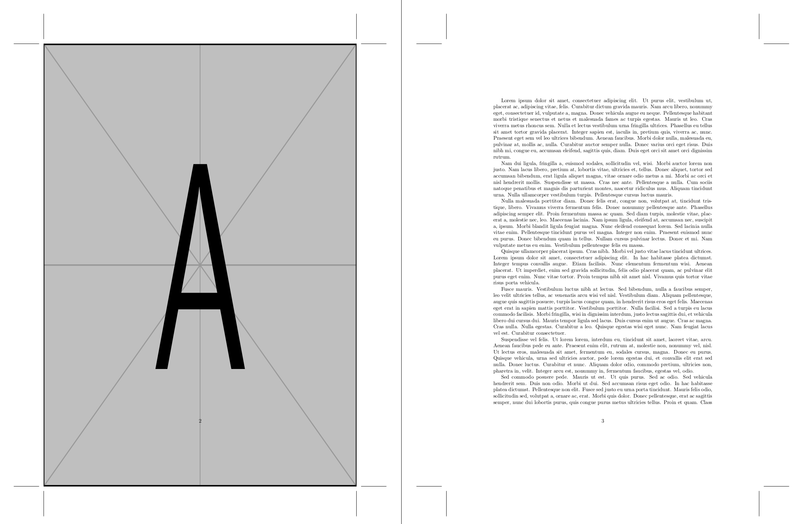 My thesis cover has an image that stretches over the entire pagewidth. This is nice in PDF, but I expect that the outer few milimeters cannot be printed. In indesign or similar programs, the printed document can be larger than e.g. A4 format, with print margins. You can provide an image that is slightly larger than the pagewidth, toghether with cutting/print markings that show where the paper should be cut, which will then remove a small portion of the image, but results in no whitespace at the sides. Can I also do this or something similar in LaTeX and if so, how? I guess I could make my cover in InDesign or PhotoShop, but I would like to use LaTeX for this. The geometry has the showcrop option which displays crop marks, so it is just a matter of using the appropriate layout and making the paper size slightly bigger. In the following example, I used A4 paper (21cm x 29.7cm) and added 3cm margins all around for the crop marks. For the cover image, I used TikZ to place the image in the centre of the page which is sized to be the layout width and height. These values can be accessed through \Gm@layoutwidth and \Gm@layoutheight from the geometry package. Note that this solution will stretch your image to fit the layout size; so you'll have to make sure that the cover image has the appropriate size and resolution otherwise the result might look distorted and/or pixelated. Not the answer you're looking for? Browse other questions tagged graphics margins printing or ask your own question. What is bleed, and how do I achieve it? Adding crop marks to a4 document to crop it to book without changing the layout?